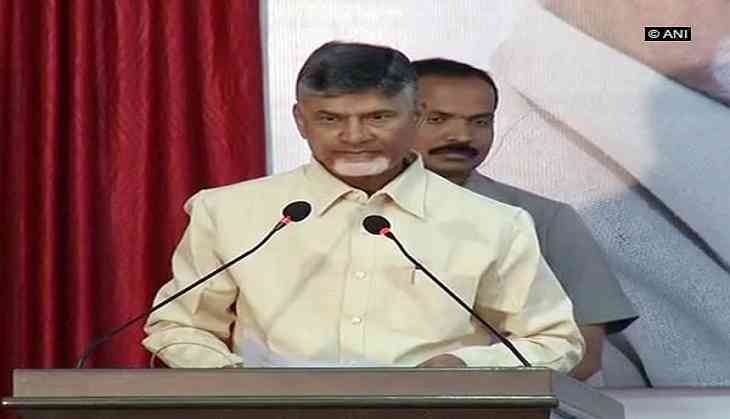 Andhra Pradesh Chief Minister Chandrababu Naidu on 27 September offered prayers at the Kanaka Durga temple for the state's technological and educational developments. On the seventh day of the 10 day-long festival, Naidu offered prayers to Goddess Kanaka Durga. While speaking to the media post the prayers, he said, "With goddess's blessings, we are gradually overcoming the difficulties post bifurcation (AP and Telangana). The world today is knowledge driven society. May all the students get her blessings." He also revealed that he prayed for the success of Prime Minister Modi's 'Swachta hi Seva' campaign and that of the water grid, which will help reduce power tariff. "I also prayed to make our projects to resolve water problems. I took a pledge for smart water grid that would be useful for drinking and irrigation. We are trying to reduce power tariffs through a smart power grid," he said. He assured the people that Andhra Pradesh will become a hub of knowledge in the future. "I wish Goddess Saraswati to make AP a knowledgeable state. That will become a reality in a very short span. AP will become an education hub," he said. He also wish for the success of the Godavari-Penna interlinking project. He added that he would like to spend more Dasaharas in the temple. The Kanaka Durga temple on Indrakeeladri hillock in Vijayawada and Dasahara celebrations thereat are very popular in South India and attract lakhs of devotees. The last four days beginning from today are considered to be much auspicious. Today the deity appears in the avatar of Goddess Maha Saraswati. Particularly, today is considered to be the day of birth star (Mula) of Goddess Maha Saraswati. Huge number of devotees thong the temple to offer special Mula Pooja. This is the place where Arjun (a ka Vijay) of Pandavas did penance for the blessings of Goddess Durga. The city Vijayawada derived its name from him.